Metro has just launched a new Adopt-a-Stop program. 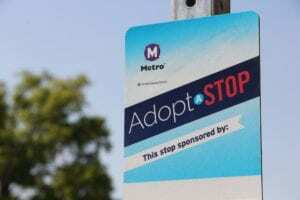 Adopt-A-Stop is a bus stop sponsorship program where businesses, organizations, and individuals are invited to adopt a neighborhood MetroBus stop and help keep the area around it free from litter. Many residents and businesses already try to keep nearby bus stops clean. Now Metro is offering additional encouragement. Sponsors will be provided with trash bags and other materials needed to keep up their area as well as having their name displayed on a sign. It is free to sponsor a bus stop. For more information on adopting a stop please visit Metro’s website or call 314-982-1466. This post was updated on August 4, 2016 . Read more news about Uncategorized.